Are splits one of those things that you just envision all good yogis must be able to do, but meanwhile you think to yourself you will never quite get there? They can be quite intimidating, it's true. But like anything worth doing, it takes a lot of practice and patience to get there. You won't just one day wake up and be able to fall into them. The good news is that there are a number of great yin yoga poses that you can practice regularly, and quite passively, that will slowly open the groin and hamstrings and get you closer to these coveted side splits. In fact, though I'm the one that prepared this class, side splits are a weakness of mine. But now that I've created this practice, I'm going to do it several times a week to reach this goal. As this is an intense practice, please do have props handy. I recommend a set of two blocks and a blanket. The biggest tip I can provide for these stretches, is to be still. Like all yin yoga poses, don't tense up or force yourself into the deepest form but allow time to open the body further. 1. 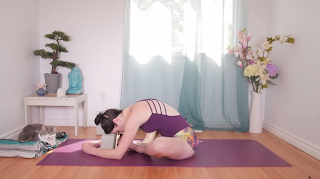 Butterfly Fold - From a comfortable seat, bring the soles of the feet together and allow the knees to fall to the sides. If your knees are quite elevated, you may want to use a block under each knee for added support. Relax your chest and let the head hang heavy. You may choose to support the head with a block or let it dangle here. Gradually ease further into the pose as you hold this for a few minutes, breathing in and out through the nose. 2. Forward Fold - For a bit more stretch in the hamstring, extend the right leg long, bringing the left foot to the upper right thigh. Keep a micro-bend in the extended leg, particularly if you are working with any injuries in this area. This is a slight twist, as you turn your torso to line up over the extended leg. Start to walk your hands forward, making your way into a fold. Similar to the first pose, you may want to use a block under the bent knee, or to prop the head. Melt into the shape as you remain here for about three minutes. There is no need to rush as you make your way out of this side, and set up for repeating with the left leg forward. 3. Wide-Legged Child's Pose - From hands and knees, take the knees quite wide and bring the toes together. Sink the hips towards the heels. Meanwhile, walk your hands forward and come to rest with the forehead on the mat. Bring the focus back to breathing in and out through the nose in this restful pose. Sink your hips a little bit further towards the mat over time. 4. Frog Pose - To set yourself up, grab the blanket and arrange it across the mat in the opposite direction. Creating a padded spot for your knees as you once again take them wide. Set up here is similar to child's pose, however this time the hips stay aligned over the knees rather than sinking back toward the heels. Flex feet and bend your knees at about a 90 degree angle. Hips stay lifted here as you lower your upper body down. Use props to support the belly and/or the forehead as feels good. Remember not to push, but let the pose deepen with the body over time. Try to hold this intense stretch for about three minutes. 5. Straddle Fold - Coming to your seat, extend the legs long and towards the sides. Take this straddle to your edge, where you feel the joints opening up and a bit of resistance. Hinge the upper body forward, once again placing a block under the forehead for additional support if you want. As in the previous stretches, this prop can be lowered or removed over time. Turn your palms up and surrender into the pose. Don't forget to finish with a nice restorative savasana after these deep stretches.